1996 - Of course, this was all marketing hype, as the system, released in Japan on June 23. Thousands line up to be the first to experience the world's first true 64-bit home video game system. More than 500,000 systems are sold the first day even though it was actually a bit disappointing from a performance standpoint. Nintendo also stubbornly retained the old and expensive cartridge format, despite the CD-ROM drives in the machines of its competitors. This would prove to be a crucial miscalculation, as the CD-ROM format allowed the PlayStation and Saturn to do things that the poor old N64 just couldn't manage. It also raised costs dramatically, cutting down on the system's third party developer support. 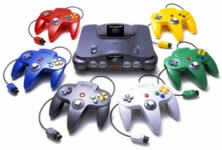 Nevertheless, the N64 sold respectably around the world, but it was definitely in a distant second to Sony's PlayStation. For the first time since the video game revival, Nintendo was not in first place. In early September, Nintendo introduces the Game Boy pocket, a sleeker, 30-percent smaller version of the world's most popular hand-held video game system. On September 29, Nintendo 64 launches in North America. The entire initial shipment of more than 350,000 units is sold out in three days. Super Mario 64 is proclaimed by many as "the greatest video game of all time!" For the Super NES we saw the release of the third game in the continuing Donkey Kong series, Donkey Kong Country 3: Dixie Kong's Double Trouble. 1998 -Nintendo introduces Game Boy Color and innovative devices Game Boy Camera and Printer, bringing new life to the longest running hit in the history of interactive entertainment. Pokémon, a breakthrough game concept for Game Boy, was introduced to the world and generated a nationwide craze to collect 'em all! With the release of Banjo-Kazooie for Nintendo 64, new characters were added to the ever-growing list of popular Nintendo characters. The most anticipated video game ever, The Legend of Zelda: Ocarina of Time for Nintendo 64 was released, setting new standards and breaking records for pre-sell for any video game to date. n64 roms can now be played on Apple iPhone N64 emulator. zelda 64 has to be zipped in order to fit on the memory card. © 1998-2000 N64emu. All rights reserved.